These days, with the advent of food technology, food processing has become complex. Hence, consumers have a wider choice of processed food which creates a situation where consumers are exposed to a variety of food that may contain prohibited (haram) ingredients with E-codes, but will be unable to understand the critical importance of ingredient sources today as they are not clearly apparent. The Halal certification process is connected with aspects such as labour law, environment-friendliness, animal welfare, nature, organic, food safety, hygiene, and fair trade. Halal is not only for Muslims, but it is for a wider consumer base as it prevents chronic diseases and creates more jobs and international tourists. The consumer base comprises a huge diversity of people from different countries, of varied tastes and demands. But with one common bond – they all seek the assurance represented by the Halal symbol. A symbol that shows that the food they eat, the pharmaceuticals they use, the cosmetics they apply, and the services they demand are all certified, lawful and wholesome in keeping with ethical principles and laws. Changing world demographics and increasing global demand are resulting in new opportunities in the global Halal food market. The growing Muslim population will increase demand for Halal food products, and the emergent consumer market of non-Muslims who consume Halal food products for ethical and safety reasons will become increasingly important. Increasing incomes in Muslim-majority countries around the world have driven consumers to seek new and differentiated Halal certified products that are not readily available in the market. The global Halal industry is worth $2.8 trillion and most of it is being produced by non-Muslim countries such as Singapore, Australia, Thailand, New Zealand, the UK, USA and India. The 1.8 billion global Muslim population largely resides in countries where the economy is growing, while enjoying higher income levels, and reporting higher expenditures on quality Halal food, and creating substantial marketing opportunities for Halal food products. Also, while developed countries are seeing declining populations with shrinking families, Muslim nations are seeing rapid growth and larger families. Both the trends are fuelling growth of Halal products. According to the Halal Industry Development Corporation of Malaysia, among all Halal products on a global scale, 10% is represented by meats, and 35% – processed food and non-alcoholic beverages. Value-added beef products and deli are classified within the processed food category, which includes a wide variety of products, such as cookies and candies. The remaining categories, such as dairy or fresh produce, are fragmented and proportionally small by comparison. The concept of Halal does hold a sort of universal meaning, and while Halal certification is a necessity, it is insufficient on its own to succeed in international trade due to the inconsistencies in terms of standards mentioned above. Halal products must also hold up to world-class standards of quality, safety, packaging and labelling. It has been observed, for example, that most Indian base imported Halal products in the Middle-East have failed due to poor packaging, inconsistent supply and lack of sustained branding. Equally important, integrity within the Halal supply chain must be preserved. If consumers lose confidence in the status of Halal, sales and trade will be affected. The Middle-East is a strong market for Halal products. The Gulf Cooperation Council (GCC) member countries include the wealthy nations of Saudi Arabia, Kuwait, Bahrain, Qatar, the United Arab Emirates and Oman. Their annual food imports were estimated to be worth more than US$73 billion in 2015. Members of the GCC have higher incomes and consequently higher per capita rates of consumption. In addition, the region must import 80% of its food requirements. Saudi Arabia and the United Arab Emirates (UAE) are seen as the most important import markets in the region. However, key Halal markets also include Algeria, Iraq, Morocco, Iran, Egypt, Turkey, Tunisia, Jordan, Yemen, and Syria. The UAE has introduced its Halal logo in 2015, Halal India (India’s certification authority) is closely working with all GCC countries’ ministry to promote Indians’ Halal certified products into GCC market. The Middle East and North Africa (MENA) has a population of 475 million people, predominately Muslim. There is a high concentration of wealth in the area and in recent years, there has been rapid infrastructure growth facilitating trade and a booming tourism industry. Halal is an Arabic word meaning lawful. The opposite of Halal (lawful) is Haram which means unlawful or prohibited. Halal is a broad term that can be used in reference to all facets of Islamic life. The usage is with regards to meat products and the Islamic slaughtering rite. The practice of Islam includes observing dietary laws that define foods that are Halal. For Muslim consumers, meat products must be verified as Halal and must originate from certified slaughterhouses. Many food products are clearly Halal or Haram. Others may be referred to as Mashbooh, which means doubtful – Swine/pork and its by-products; Animals improperly slaughtered; Animals killed in the name of anyone other than Allah; Alcohol and intoxicants; Carnivorous animals, birds of prey and land animals without external ears; Blood and blood by-products; and Foods containing any of the above products. Foods containing ingredients such as gelatine, enzymes, and emulsifiers are questionable (Mashbooh) because their origins are not known. 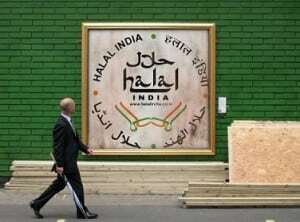 India remains a small supplier of Halal products, with approximately 180 million Muslims. However, the increased demand for Halal products in the Middle-East, southeast Asia, and North Africa, spells an opportunity for Indian companies to capture new markets, particularly in countries such as the United Arab Emirates, Saudi Arabia, Kuwait, Egypt, Malaysia, Singapore and Indonesia. With advanced technology, equipment and facilities, Indian companies are well positioned to meet the needs of Muslim communities in becoming a leading supplier of Halal food products throughout the world. Nevertheless, Halal is a new business term that has captured the different segments of various businesses globally. Apart from the food and beverage industry, Halal compliance and certification are gaining momentum in service-oriented industries across the globe. The word defines two aspects of life, permitted and wholesomeness. Over the past couple of decades, the word has been coined into a buzzword. A business slogan by itself, it has now converted into almost US$3 trillion worth of global business and revenue, farm to fork Halal compliance requirement. Now Halal is not just a lifestyle but has evolved and prospered into a very dynamic, flourishing and perforating global industry. With its application & implications in all different commercial sectors all over the globe, development of Halal and its proper utilisation for the industry has become imperative and momentously contributes to all facets of economic growth. The concept of Halal permits an exposure of its origin. It has made an impact on the ever growing global economy paving its way to being the new global market driving force. Turning more than a trillion dollar business in the service segment alone, Halal compliance has become a significant selling factor. Cutting across tourism, medical tourism and logistics, Halal certification requirement includes the place of stay, food we eat, place of storage, transportation of the raw materials and even medical treatment. Halal-compliant medical tourism is a growing need in the industry to cater to patients flying in from the Middle-East, Asia-Pacific and European countries in the contemporary scenario. Then the compelling need to have Halal-friendly business compliance is the social responsibility it implies. All over from the business, consumer and community perspective, Halal compliance and its implications are being made an inevitable quality to have, predominantly in the service industries like travel, tourism, hospitals, banking, food and lodging.